Congrats to Tiffany and Sam! They tied the knot at the Surf and sand Resort in Laguna Beach! The image above is my favorite of the day, right after the ceremony, the guests blew bubbles as the couple walked down the isle as husband and wife. Sam getting ready- I love the image of the football game on the TV. I captured this image right before Tiffany and her Dad were to walk down the isle, I like the contrast of the light running down the image, adds to the drama of their entrance. 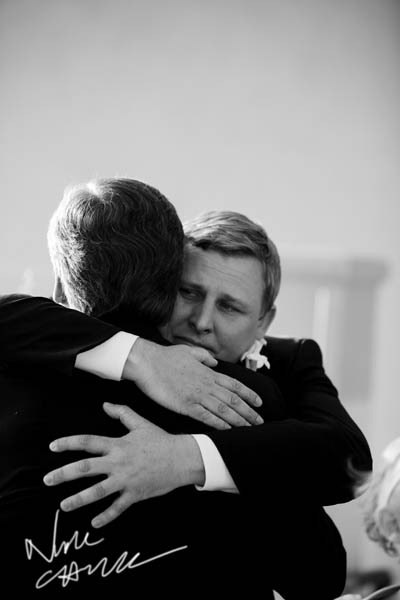 This emotional shot of Sam hugging Tiffany’s Father right before he gave his daughter away is what it is all about. This image was captured right after the ceremony, while the guests were whisked away to cocktail hour. Tiffany could not wait to get out of her shoes!!! This is great, the bride is barefoot, and the shadows fall into the base of the shot. Someone had built the sandcastle in the background, so we had to use is as a photo prop! during the speeches, reactions of the bride and groom are priceless. First dance, I love the way the groom is holding his bride. A special thank you goes out to my Bride Tiffany, I was so honored to photograph her wedding, when she first contacted me, I was already booked, so she changed her date!!!!! How flattered am I? !